Food & Wine How do I make a great salad in winter? How do I make a great salad in winter? 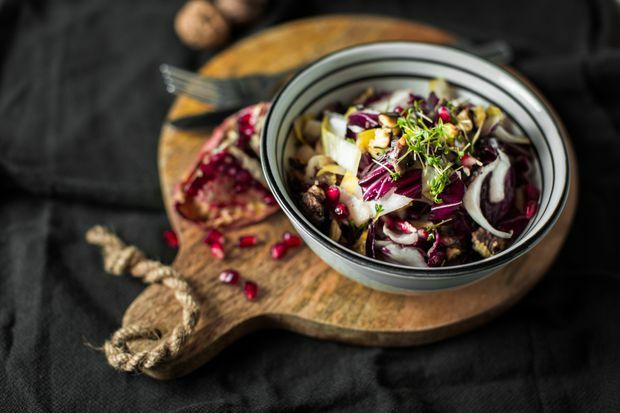 A well-made salad is lively, palate-pleasing and beautiful to look at, not limp, tasteless or dull, which is the issue with many winter salads. But this time of year encourages you to look at what is in season. Most lettuce is not in season in winter and what you find is of debatable quality. However, by using sweet potatoes, apples, beets, Jerusalem artichokes, mushrooms, cactus pears, tamarillos and various citrus such as blood oranges and Meyer lemons, salads become more substantial and more stimulating. If you must have lettuce, turn to chicories such as radicchio, Belgian endive and escarole. They shine in winter. Because of the robust taste of these lettuces, the dressings need to be more assertive. Add chopped shallots or red onion to a basic oil and vinegar dressing, and whisk in some grainy mustard to give it some bite. Tomatoes are even worse in winter. Sometimes you can buy good cherry tomatoes, but larger ones are tasteless and flabby. There is a way around this, though. Bake them on a parchment-lined sheet at 350 F for 30 minutes and what flavour they have will intensify. Don’t use them with lettuce, mix them with cucumbers, fennel or drained white beans. Add some chopped onions, a whisper of garlic and some capers and anchovies for a fabulous veg-based dish. Cooked vegetables also make excellent salads. Steamed or roasted vegetables such as carrots, cabbage or squash are improved with more unusual dressings. Miso ginger is my favourite for this kind of salad. Whisk together ¼ cup light miso, 1 tablespoon rice vinegar, ½ teaspoon grated ginger root, 1 tablespoon vegetable oil and ½ teaspoon sesame oil. This dressing is also good over noodle salads. Use tahini instead of miso, but stir in a couple of tablespoons of mayonnaise. Avocados are easily turned into a salad. Dice the avocados, add chopped red onion, diced cucumber, diced cherry tomatoes (if you can find good ones), pickled jalapeno and a vinaigrette based on guacamole with 3 tablespoons olive oil, 1 tablespoon lime juice and ¼ teaspoon ground cumin; stir together. Dust salad with chopped cilantro. Don’t forget salt on the avocado and in the dressing. White beans with celery, radish, apple, baby kale and an Italian vinaigrette also make a good side salad with chicken or pork. Another great combination is beet, feta, red onion and pumpkin seeds with a dill vinaigrette. Crunch or texture is important in salads for mouth feel. Use roasted nuts, sunflower or other seeds, roasted chickpeas or wasabi peas. Unflavoured popcorn chopped up a bit also works, as do croutons, crisp fried onions or onion rings. Sprinkle some sugar on nuts and bake at 350 F for 10 minutes for a sweeter crunch. Try roasting grapes for another sweet touch or add grated apple into a dressing for some texture. As citrus is especially good at this time of year, slice oranges or grapefruit into a salad. A great combination is oranges, shaved radish, thinly sliced red onion and olives. Get your imagination working and come up with your own splendid seasonal salads.